The 3rd December marks 22 years since the very first text message was sent. In 1992, an engineer sent the text message "Merry Christmas" to a mobile device on Vodafone's UK network. 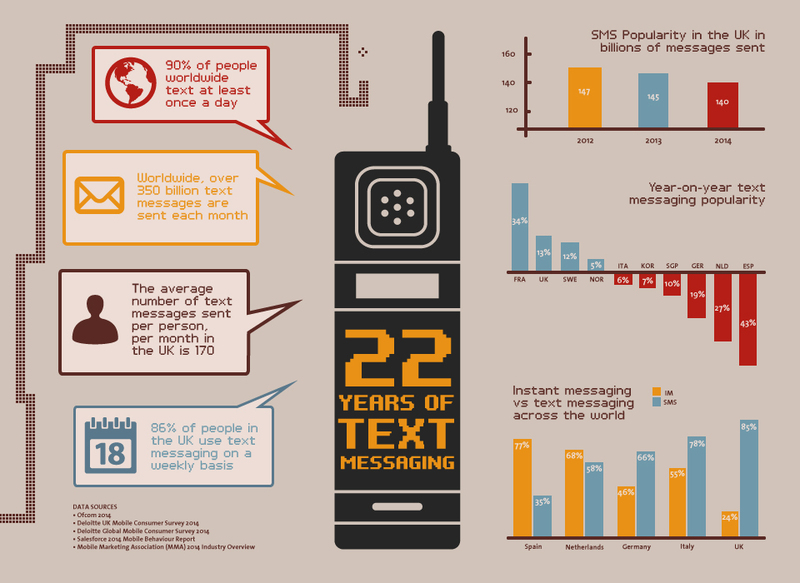 Over 20 years on, and text messaging has grown into one of the most popular methods of communication worldwide. Below are some 2014 text messaging statistics. Text messaging has declined in popularity in a number of European countries. People in the likes of Germany (-19%), Holland (-27%), and Spain (-43%) are all using text messaging less in 2014 than they were during 2013. On the other hand, 34% of people in France believe they are using text messaging more frequently in 2014, with 13% of people in the UK saying the same. Despite the overall volume of text messages declining, people still use SMS regularly during a given week. Compared with Italy, German, Holland, and Spain, people in the UK use text messaging the most frequently, with 85% of people using SMS in the past 7 days. Spain have the lowest frequency of texters, with only 35% of people using SMS in the past 7 days, as instant messaging such as Whatsapp is significantly higher (77% of people). See below for our handy fact sheet showing text message popularity in 2014. Interested in learning more? Take a look at the technology and engineering courses available at The Open University.